Yesterday marked one of the most important dates for super heroes in cinematic history: It was the 25th anniversary of the cinematic debut of Tim Burton’s Batman. That film was one of the progenitor super hero films, along with Richard Donner’s Superman, and it showed the world that The Dark Knight could be more than just a campy, family friendly character (no offense of course to Adam West and the wonderful cast of the 1960’s TV series.) 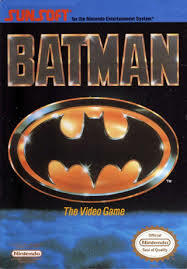 The NES game inspired by the film from Sunsoft was also one of the early games based on a comic book character on the platform, and it too showed just how much fun it is to play as the Caped Crusader in a video game. Though Batman: The Video Game is technically a licensed gamed, again being based on the Tim Burton film, it borrows little from the source material other than a basic plot of Batman trying to catch the Joker as well as some lines from the film found in between level cut-scenes. 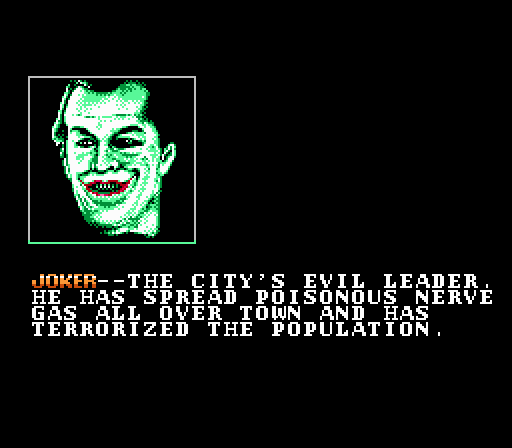 In fact, if you swap out Batman and the Joker for two original characters, this could be a wholly original product from Sunsoft. Batman and his nemesis are immediately recogonizable in game, especially the superb rendition of Jack Nicholson’s Joker in cut-scenes, but other boss characters taken from the comics, which according to Wikipedia (I don’t have the games booklet, unfortunately) are Killer Moth and the Electrocutioner, could be anybody. The first boss flies and shoots things at you, so I always assumed it was Firefly from my limited knowledge of Batman characters at the tender age of five, but it turns out that’s Killer Moth. How true the game stays to either the canon of either the Batman film or comics is immediately forgotten when you start playing the game and you find out how much fun it is. 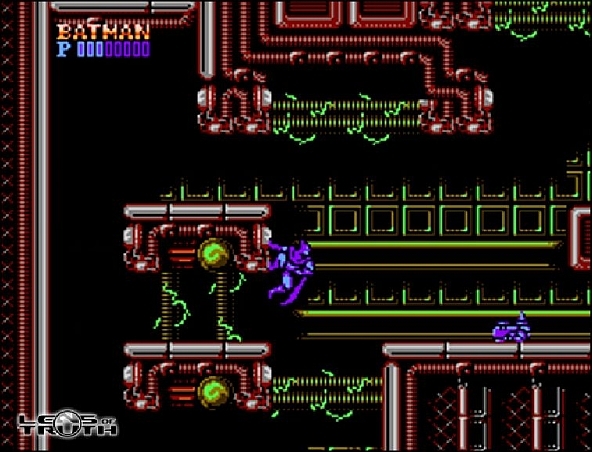 Batman plays like fellow classic action games on the NES such as Ninja Gaiden and Castlevania; Batman’s primary abilities like most NES action game are jumping and attacking, but you can also quickly cycle between three different projectile weapons and wall jump, similar again to Ninja Gaiden. Batman’s abilities do seem paltry, but this is an example of an action game where the game is strategically designed around maximizing the enjoyment from these mechanics. The game starts off easy enough; gently easing you into leaping from wall to wall and knowing when to either fight up close or from a distance, but by the end of stage five, should you make it there, you’ll need to have complete mastery of all your moves to get through some tricky jumps lined with punishingly placed enemies. Make no mistake, this is a very tough game, and making it to the final encounter with the Joker, let alone beating him, requires patience and a love for classic 8-bit action games. While the game is difficult though, it’s not say to the point of unfairness. Unlike say, an LJN/Acclaim game, you have unlimited continues and when you reach the second or third part of a level, you’ll continue from there. Sunsoft’s Batman doesn’t at any point in the game use an 8-bit rendition of the classic Danny Elfman theme, but the music in game is such a joy to the ears that you’ll find yourselves humming the level and boss themes even when you’re not playing. This is something that we can be thankful for, as it makes learning some of the more difficult stages patterns much easier knowing that even when you’re at your most frustrated, the music will not be there agitating you more than you already are. Much like the music, the sprite work in animation is top notch with great details such as Batman’s cape slowing flowing down when he comes to a stop. If I had to file a complaint against Batman: The Video Game other than its lackluster use of the license, it would have to be with the games length. The game is only five stages long and once you have the enemy layouts and the bosses movements down, you can fly through the game in a little over a half an hour. That being said, that is not an uncommon playtime, as games like Castlevania and Ninja Gaiden are not terribly long either. Batman on the NES is not an example of a great Batman game, more like an excellently crafted game that just so happens to have Batman in it. That shouldn’t keep you from enjoying the game though, whether you’re a fan of the character or not. Any fan of 8-bit action game are doing themselves a disservice but not having this game in their collection as it can easily stand should to shoulder with the best the system has to offer. If this game had set the standard for all movie based games that followed it, there probably wouldn’t be that many titles based on films clogging bargain bins and flea markets.